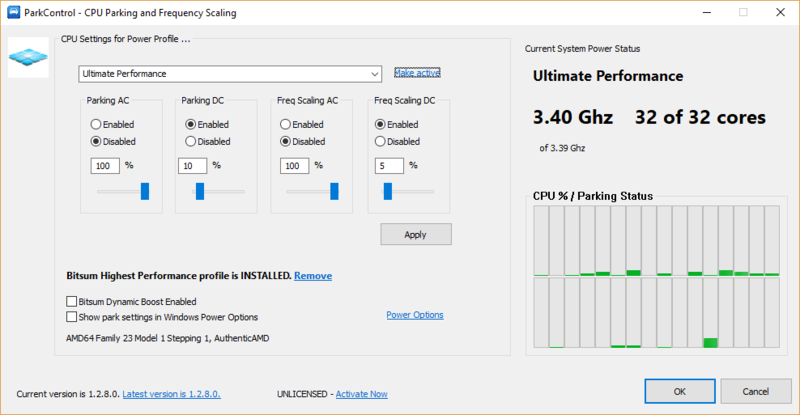 Microsoft announced the Ultimate Performance power plan to be part of Windows 10 for Workstations at version 1803 and above. This new plan disables core parking and CPU frequency scaling on AC power – just like our years old Bitsum Highest Performance power plan. For those that want the original Ultimate Performance plan as provided by Microsoft, you previously needed Windows 10 for Workstations, a specific edition that is not Windows 10 Pro or Windows 10 Home. It turns out that the definition for the Ultimate Performance power plan exists on all editions of Windows 10 version 1803+, but is hidden. Fortunately, it can be enabled by simply cloning it to a new GUID! This page will present a small GUI took to do it for you, and powercfg directions to do it yourself. It turns out that the definition for the Ultimate Performance power plan exists on all editions of Windows 10 version 1803+, but is hidden. Fortunately, it can be enabled by simply cloning it to a new GUID! This little install-less GUI clones the hidden Ultimate Performance power plan, enabling it’s view on the OS.
! NOTICE ! This will NOT work on Microsoft Surface or other devices with locked down power plans. An error stating such will be presented if you try. Doing it yourself at the command line is also easy. 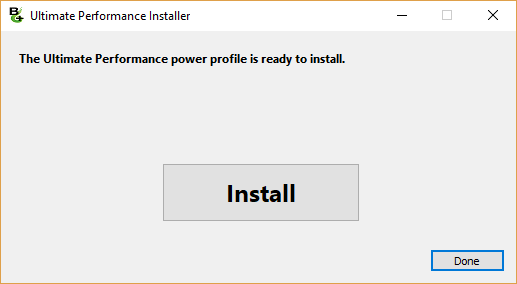 Note that unlike the simple Ultimate Performance Installer above, there is no error handling or check to ensure installation worked. After running this command, the new power profile will be available to switch to if the OS is supported. An initially successful response indicating the GUID of the cloned power profile may be misleading on some devices where the power subsystem is actually locked down. If you are curious what the Ultimate Performance power profile does, it is essentially Bitsum Highest Performance in that it disables core parking and CPU frequency scaling.